A holiday in Malaysia will be like no other. With various tourist destinations to choose from spanning across 13 states, you cannot help but be spoiled for choice as to where to go. If you are into history and love discovering more about a particular place that you visit, then Melaka is the right place for you to visit. Melaka is known as the historical city of Malaysia and is rich in heritage, culture and several historical sites that will definitely make your day. One such destination that you can consider visiting while in Melaka is the Melaka Sultanate Palace. This building is the exact replica of the palace of the Melaka Sultan. The palace was built based on the ancient Sejarah Melayu which mean Malay Annals and has the exact annotations and features as those that are found in the book, making the palace a must-see because it brings the book to life. The detailed architecture is mesmerizing and is a work of art not to be missed. Two types of wood were used in the building of the palace and they are the chengal and the rasak wood. The design of the roof is a work of art in its own way. Made from belian wood, the red shingle roof houses the majestic palace that is held together only by wooden pegs; an interesting architectural work of genius and a must see. The red shingle roof is multi-tiered and the exterior of the palace is decorated with Chinese mirrors, showing how the architectural design back in the day was greatly influenced by various cultures and heritages. The replica of the palace was transformed to become the Malacca Cultural Museum that it now is today. It was on the 17th of July in 1986 that the fourth prime minister of Malaysia, Tun Dr. Mahathir bin Mohammad officiated the museum. 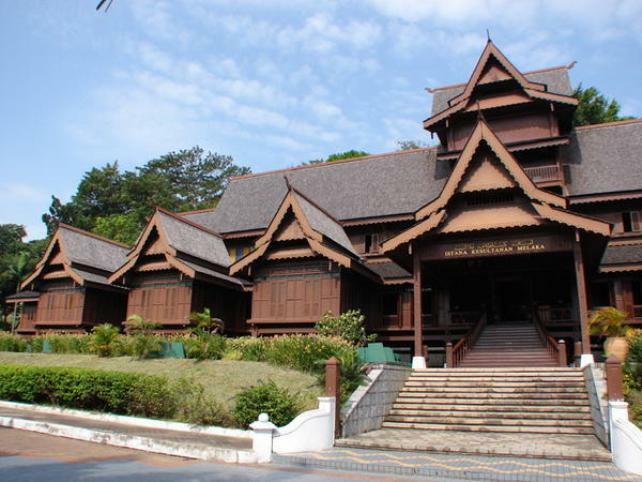 A visit to this museum will allow you an insight into the unique heritage of the Malay Sultanate of Melaka and the life in Melaka during the early part of the 15th century. The museum houses many artifacts, photographs, weaponry, traditional dresses of women as well as brassware that were a feature of the time. You can even walk through the chambers of the Royal band, view decorative art pieces that were produced in the 15th century and even see the emissaries and gifts that were presented during that time. The museum has set up a gallery to depict the fight between the local traditional warriors Hang Jebat and Hang Tuah.